Etiology: Chronic interstitial glomerulonephritis is considered an old age change. 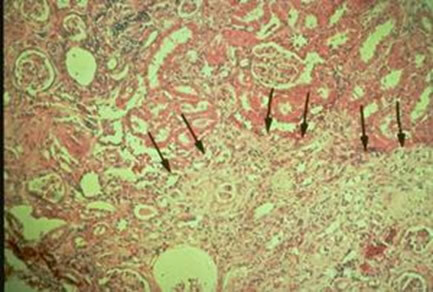 Chronic interstitial glomerulonephritis may occur in combination with neoplastic lesions. Incidence: This condition is common in aged gerbils. Clinical Signs: Gerbils with glomerulonephritis develop polyuria and polydipsia, and progressive weight loss. Pathology: Grossly, kidneys are shrunken and pitted. Histologically, there is glomerular hypercellularity, thickening of glomerular basement membranes, tubular degeneration with dilation and protein cast formation and infiltration with mononuclear cells. Fibrosis (arrows) may eventually obscure normal renal architecture .